Amelia is ten years old and when she looks in the mirror she sees herself as a grown-up woman, with aviator goggles and headgear. Her whole family got involved in this adventure: her uncle, who built a slide to fly on a wooden box, the dad who accompanies her on the roller coaster, and her mum who observes them happy. Her dream: to pop out of the clouds on an airplane. The story is inspired by the life of Amelia Earhart, the first woman to fly solo across the Atlantic Ocean in the 1930s. 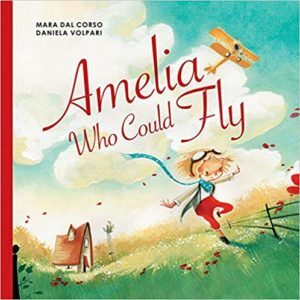 The picture book is divided into two parts: the first and longer one gives a glimpse of Amelia’s daily life at the age of ten, her passion for flying and sharing everything with the members of her family. The illustrations are very careful and they portray a smiling and cheerful Amelia, in bright and harmonious environments, with warm and soft colours. 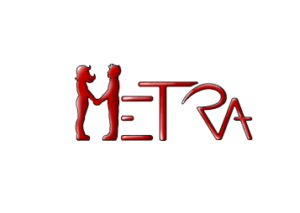 The second part presents a brief biography of the woman who inspired this story, with photos of her time which portray her in different moments of her adventurous life. They show a woman who is strong-willed and also in harmony with her own context (in human and environmental terms). A context which supports and encourages her: her father, in fact, brings her to the roller coaster, and the balloons of the fair fly towards the sky, pointing Amelia to her destiny. In this book, the text and the illustrations mix in a joyful and “aerial” narration. The book is particularly suitable for an accompanied reading, mostly because of its final part, which is quite rich in historical information and encyclopaedic elements.